Hi David, amazing and very detailed write-up. Am I right, Bitcoin was introduced by software developers to the world in 2009 and perhaps this is the only write-up where author has mentioned why we do not need it. I really enjoyed reading this. Hi David - this is why I argue there are two revolutions underway, both addressing the same (technical) requirement but each having very different trust/game-theoretic assumptions and hence address very different 'business' requirements. 1) the game-based consensus revolution (as you describe it) which, at its core, attempts to provide censorship-resistance with respect to transaction confirmation and so enables things like cryptocurrencies. 2) a more permissioned (perhaps more centralised) revolution which attempts to enable applications to be built at the level of industries/markets rather than firms (as is presently the case, hence needing to endless, mindless reconciliation between firms) without requiring the introduction of new business-level intermediaries such as CCPs, etc. At the technical level they both rest on the idea of 'trust but verify' (in that nobody blindly believes what a database operated by somebody else tells them; they run their own copy of the software, which verifies for themselves) but they differ in who/what they trust to determine if a transaction has been confirmed or not. This latter point is important... the ONLY service that, say, bitcoin miners are providing at their core is transaction ordering... ie they are the arbiters of which transaction came 'first' in the event that two happen to collide (eg a double-spend). This is the thing you can't decide for yourself by independently valuing a chain of transactions. Revolution 1) typically imposes no limits/rules on who can participate in the confirmation process (and hence limits censorship) but at the cost (at least with today's algorithms) of only probabilistic finality. 2) typically is more strict on how consensus is formed in order to deliver finality but at the cost of (potentially) enabling those parties to suppress transactions. Richard, thank you for this thoughtful response. If I've missed the point with my "just use a centralized database," then I'm sure I'm not alone! To me, having the data live on a central ledger (with multiple copies distributed however one likes) open for all to see does not necessarily mean (to me) that "a centralized database is designed on the assumption that the operator is trusted." I admit, however, that you are likely to know better than I what is involved here given that you're working in the space. I look forward to seeing a practical application of enterprise-level blockchain. Cheers. Hi David. I freely admit I could be totally wrong! I tried to capture what I _think_ is a useful insight here: https://gendal.me/2016/11/08/on-distributed-databases-and-distributed-ledgers/ . The devil in the detail with your comment above is this: "having the data live on a central ledger (with multiple copies distributed however one likes)". The problem is: when that information is "distributed" to me, who am I trusting for its accuracy? Imagine the information was something like: "Barclays Bank now owes Richard GBP1M". And imagine further that the operator of this central database is not in fact Barclays (since it is also used to track balances at other banks or manage other types of legal agreements). Who would be willing to run such a system in a way that would convince other people to use it (think of the liability if there was a mistake!) Put the other way, who would be willing to use such a system _unless_ the operator carried liability? Simply saying "the data is distributed" (somehow) doesn't answer any questions: if I receive data through my front door then I either have to trust the person who sent it to me as to its accuracy/provenance or I need to independently check it for myself. 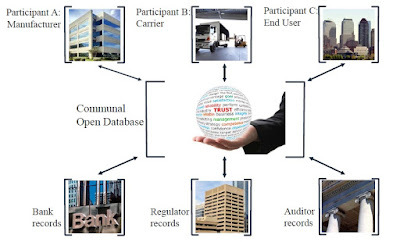 In scenarios where you can do the former (eg because the operator of the centralised databases is ALSO the firm whose liabilities it represents - as in today's banking system and associated computer systems) then just use a centralised database. But if you need to check the data yourself (by examining historical records, checking any asset movements were correctly signed and linked together, etc) then you've just described the thought process that led to Corda. ie a blockchain-inspired decentralised database.